I watched it for weeks. Eyed the bold strip of stencil-like letters identifying the space with the simple plume "COFFEESHOP." Each time I walked by on my way to and from my local Sunday farmers market, I felt a nudge of curiosity, anticipation and slight regret. When it soft-opened in January, beckoning the neighbors and farmers market dwellers in with the promise of free cups of Stumptown coffee, I couldn't help but feel left out. 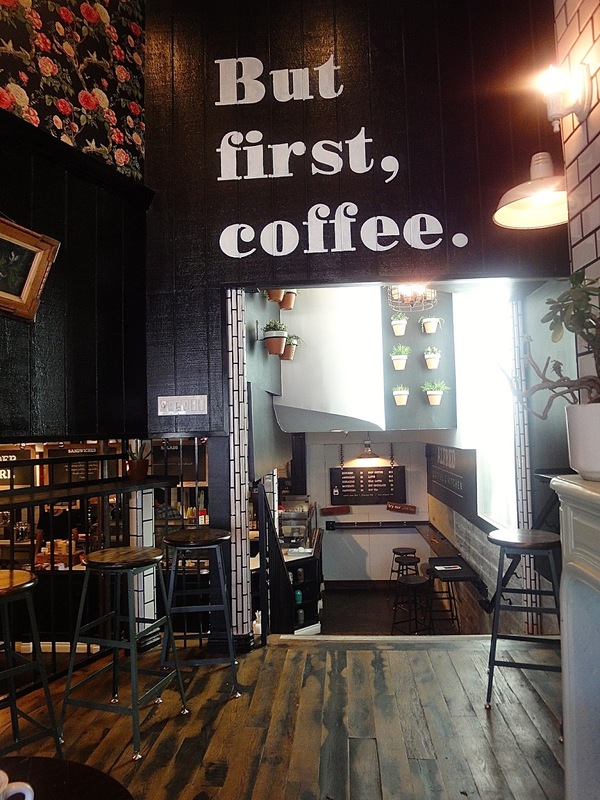 I wandered inside, gawking at the shiny new espresso makers, the moustache-enbossed coffee sleeves, the fresh-faced baristas expertly doling out latte art, and wanted desperately to be one of the throngs of people standing in queue for their morning brew. For a decade, I've embraced the tea leaf in lieu of the bean, proclaiming to all who pause to listen that I can't drink coffee. "It makes me crazy," I say, gesticulating wildly with my arms to demonstrate the extent of said "craziness." Jittery. The fastest typer in the history of typists. A 5'10'' blonde Kramer clone. And I've been fine with it. Fine to be a tea drinker, a connoisseur of the various types of green and oolong loose leaf teas, as well as rooibos, which isn't really tea at all. "It's healthier," I justify, patting myself on the back for slurping down a giant pot of jasmine-perfumed hot water in the morning while my contemporaries blast themselves awake with their carefully concocted asphalt-colored libations. Yet, all the while that I've been slurping and gesticulating, I've always secretly wished that I could enjoy coffee as more than just a flavoring in my ice cream or tiramisu - that I could be one of those people who take pictures of latte art to show off on Instagram, who meet a friend for coffee and actually order a coffee, who roll their eyes at the amateur ordering a decaf sugar-free soy mocha. So when Alfred Coffee & Kitchen made its debut on Melrose Place - my Melrose Place, where I go shopping for kale and farm fresh eggs and self-righteousness - I wanted in. I wanted to be part of its culture, part of the club of couples and friends and exhausted parents huddling over espressos and Americanos and Gibraltars, while stalling the beginning of another day. 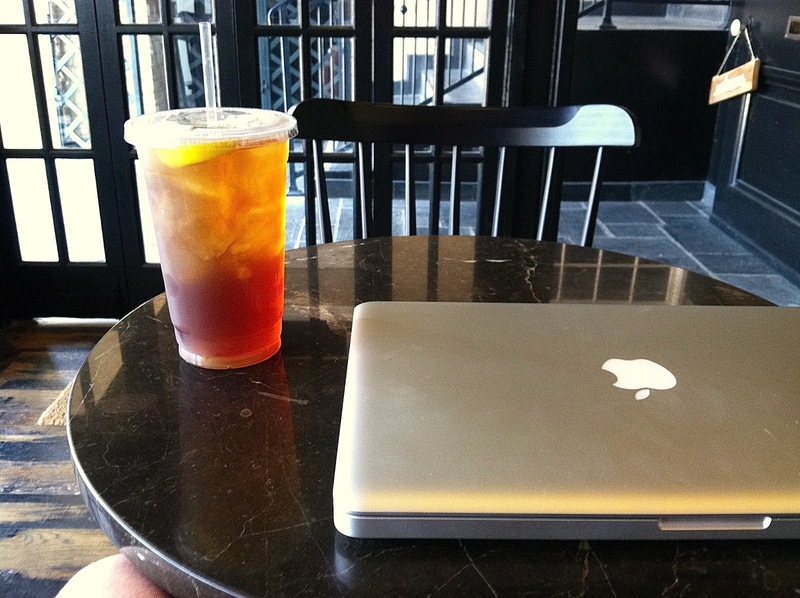 I wanted to be the person taking over precious table real estate with a laptop and more than just a cup of the specialty-of-the-day white coconut iced tea. I wanted to be a coffee drinker, specifically an Alfred coffee drinker. Moustache-enbossed coffee sleeves and all. I've started off slowly, kicking off the training wheels in recent weeks with an occasional early morning cappuccino ordered boldly and sipped proudly in front of the Alfred coffee community. Each time, it's made me a little crazy. Wild gesticulation (!). But each time, it's also made me feel connected to my neighborhood COFFEESHOP in a way that I hadn't felt with those specialty-of-the-day white coconut iced teas. An insider. Mere sips away from becoming a 5'10'' blonde Kramer clone. "Food is your safety blanket." He says. "And history is mine." He's not saying it with any sense of malice, it's more an observation, uttered without much thought or knowledge as to how significant those words will be to me. To the "us" we might have been if we weren't completely and utterly wrong for each other. I stare out the window as I process his statement, my eyes ironically falling on Mozza as we drive toward Hollywood. It seems like a sign - my favorite restaurant, a place that I know he would never appreciate in the same way that I do. Of course, if I'm going to be honest with myself, it's actually a sign of what I've known all along. On our first date when he strode in ten minutes late wearing a pink collared shirt and light jeans with decals on the pockets. When he'd gone on for 30 minutes about presidential history while I swirled my glass of Malbec and wondered how much longer I'd have to nod my head like I was genuinely interested in his theories about James Buchanan's sexuality. When he'd showed up for drinks wearing a t-shirt that read, "100% Paleo, 80% of the time." When he told me that he didn't want to go to the hot new barbecue restaurant because it wasn't… healthy. Of course, I'd known. Of course, I'd acknowledged that it wasn't right. At least not right beyond the right now. "A spring fling," I'd told my girl friends. That somehow bled into summer. It was easy to pretend in the moment. He was nice. It was nice. It, he, made me feel special in a way that I hadn't felt in a while - since the boy I actually could (and did) take to Mozza, my litmus test for relationship longevity. I know he's just making conversation, making light of the fact that I get my kicks from knowing all the restaurants in town, and that he gets his from knowing the names and peculiarities of all the Greek and Roman gods. I know, to him, it doesn't matter. Just as I know that to me, it does. That I don't want to go through life, or even another two months, nodding my head like I'm genuinely interested. That I'm done pretending, of trying to force something that isn't there and won't be there. But we go to the movie. We hold hands over the armrest like a couple, because that's what couples do, and it's nice to feel part of something. Even if it isn't anything at all. Even if it's never going to last beyond the final credits. Even if it's just going through the motions. Plucking olives from the bowl. Spitting out the pits. With no desire to eat them at all. Notes: It's no big secret that I'm not particularly keen on olives. I've declared more than a few times that I consider them to be one of a handful of foods that I actually want to spit out immediately - save for a few presentations of cooked, high-quality Italian olives in certain dishes that may or may not be served at Osteria Mozza. Obviously. But Mozza manifestations aside, I've struggled to reconcile my distaste for olives with my status as someone who more or less enjoys food. I've tried desperately to like them, sampling them in myriad forms and formats because they seem like something I should like. Because everybody likes olives. I developed this recipe with the hope that it might inspire a revelatory moment - that I might be able to come around to the putrid orbs, after all. Yet even in this form, even using olives procured from an actual olive bar, I still didn't enjoy them in the way that I felt I should. You know, head-over-heels, dizzy in… like. But for someone else, for someone who loves olives unequivocally, these nicoise toasts and provisions would likely be just the right fit. With no need to just go through the motions at all. It's not so much as a recipe as it is assembling ingredients to taste until it's right. For you, that is. Not me. Obviously. Place eggs in pot of cold water (enough to cover the eggs by an inch or so). Bring to a slow bowl, then turn off the heat, cover, and let stand for nine minutes. Remove from the pot and immediately submerge in a prepared ice bath. Cool for a good 15 minutes before attempting to peel and quarter as per the above. In a bowl, combine whatever proportions desired of the tuna, tomato, capers, olives, parsley. Add a pinch of fresh thyme, lemon, lemon zest, a swirl of olive oil, and freshly grated pepper. Stir gently to combine. Let sit for 15 minutes or so for the flavors to meld. Serve in a potted jar or bowl on a platter with sourdough toast and hard boiled eggs. Eat, according to taste. Fast food has never held much appeal for me. Even growing up, I was that weird kid who would take one bite of my McDonald's hamburger (requested plain, without sauce, without cheese, without even a slice of a pickle), and immediately abandon it in favor of my supersize order of fries. Sure I went through a brief period in junior high when I'd periodically announce to my mother, "Yo quiero Taco Bell," but my cravings for "meat mix" hard shell tacos with neon cheese were few and far between, and ceased completely when I started running more competitively in high school. Yet even in those years of Egg McMuffin and Mexican Pizza avoidance, of post-workout snacks of edamame and chicken stir fry dinners, whenever I was forced in the near vicinity of a fast food restaurant, I would somehow always end up with a McFlurry or chalk-flavored chocolate shake in my hand. When confronted with the lure of a Dairy Queen milkshake or Oreo McFlurry, my staunch devotion to eating whole, fresh foods flew completely out the (drive-thru) window. I became a teenager again - not an athlete trying to shave a few extra seconds off her personal record. Though it's been a proper decade since my last fast food dessert indulgence, I still go weak in the knees around sugar, something that has been well documented here, and in my Instagram feed. So when the Los Angeles Times "Daily Dish" reported that Carl's Jr. had officially launched their Pop-Tart ice cream sandwiches, I wasn't completely horrified. As I gorged on the description of the frosted strawberry Pop-Tart sandwiching "premium" vanilla ice cream, my eyes widening in awe, I realized that I wasn't just not horrified, I was inspired. Or at least the idea of it. Even amidst the height of my compulsion to consume the breakfast/dessert hybrid of my (and Jimmy Kimmel's) wildest dreams as soon as possible, I couldn't actually bring myself to go to a Carl's Jr. to purchase it. Mostly because, no, but also because part of me suspected that the caloric bomb would fall flat on my palate that has grown more accustomed to things… not from a box. So I did the next most logical thing - I made them at home. And because I couldn't possibly do them up with store bought provisions, I again deferred to logic and made them with homemade peach ice cream and cinnamon sugar pecan pop-tarts. Logically, I promptly ate two. In personal record time. Notes: What makes these pop-tart ice cream sandwiches so spectacular (and they *are* spectacular) is that both the ice cream and pop tarts are egregiously good on their own accord. There's really no reason to sandwich the souffle-like peach ice cream between two halves of buttery, pie-like pecan cinnamon sugar pop-tarts, except within the confines of your wildest dreams. Or a random Sunday afternoon when you've nothing better to do, but spend all day in your kitchen. One word of warning before I leave you to *it*, the end of your waistline as you very well know it, the second you bite into these ice cream sandwiches, the ice cream will try to slide out the sides. Embrace it. And then split the sandwich in half like an Oreo and eat each separately as per the image above. Using a sharp knife, carefully peel peaches. Slice in halves, remove the pits, and cut into 1-inch chunks. Place peach chunks in a heavy bottomed sauce pan with the 1/2 cup of water. Bring to a low boil, then cover, and simmer 10 minutes or so or until the peaches can easily be pierced with a fork. Remove the pan from the heat and stir in the sugar. Set aside to cool. Once cooled to room temperature, add the sour cream, heavy cream, vanilla, and lemon juice. Puree using either a blender or immersion blender until smooth with just a few chunks of peach remaining. Transfer to an airtight container and chill completely in the fridge (preferably overnight). Combine flour, salt and sugar in a large bowl. Whisk to lighten texture. Cut the butter into neat chunks, all approximately the same size, and then, using your hands or a pastry blender, work the butter into the flour mixture. Continue until the butter lumps are approximately the size of a pea. Combine brown sugar, cinnamon and flour in a small bowl. Whisk together with a fork. Stir in pecans. Set aside. Once the dough has sufficiently chilled, remove from the refrigerator and let sit 15 minutes or so until it becomes soft enough to work with. (I realize this sounds counter intuitive.) Sprinkle your countertops, hands and rolling pin with a good amount of flour (don't be shy - this dough is a bit sticky to work with!). Roll out the dough to a rectangle about 1/8'' thick, and trim it down to about 9'' x 12''. Use a pizza cuter to slice into nine even rectangles. Repeat with the other dough half. Brush the first dough with the egg wash (this will help glue the halves together so the filling doesn't seep out the sides! ), then place 1-2 tablespoons of the brown sugar/pecan mixture in the center of each. It will look like a bit too much, but it's fine to heap it in - particularly with the pecans. Just be sure to leave about 1/2 inch around the sides. Cover the cinnamon-sugar topped tarts with a second rectangle of dough. Use your fingers to pinch the sides together to seal everything in place. Press the tines of the fork all round the edge of the rectangle, and finish with a few holes in the center to let the interior "breathe" during baking. (And by "breathe," I mean, let the steam escape, obviously). Return the tarts to the refrigerator for 30 minutes while preheating your oven to 350 degrees. Place the tarts on a lightly grease or parchment-lined baking sheet (I divided into two batches because I didn't want to crowd my tarts!). Bake for 20-25 minutes or until golden brown on the edges and lightly browned on top. (Mine took closer to 25). Remove from the oven and cool on a wire cooking rack. Once cooled enough so that they won't melt the ice cream on contact, use a large chef's knife to cut the pop-tarts in half. Scoop a good sized knob of ice cream onto the bottom half of the pop-tart. Top with the other pop-tart half. Eat. Fast!